Everyone notices a clean car—and everyone notices a dirty one. 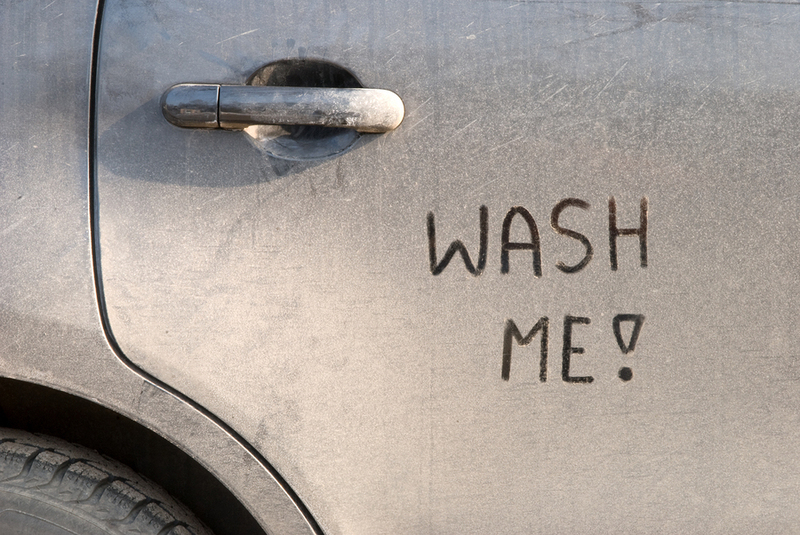 Those cars that have “wash me” written on the side or back window always catch a driver or rider’s attention. No one wants to be the driver with the common saying in obvious neglect. However, what seems like a childish lark, can actually be harmful to those inside the vehicle and the car’s body on the outside. Dirt has many negative effects on paint. Not only does it make the car look old, but writing in dirt on the vehicle can cause scratches and other permanent damage. Also, dirt that mixes with rain can create an acidic compound that can weaken metal, and show noticeable damage on the surface. Keeping the outside of the vehicle clean can also help with the resale value if a car owner plans to sell the vehicle later. However just because the outside is clean doesn’t mean that the harm to the vehicle (or its passengers) is gone. Dirt is a carrier of bacteria, meaning that there can be a silent danger right in the middle of a common necessity that people use every day. Car owners trust their vehicles with their families, and even the safest drivers cannot protect those they love from the diseases found in the dirt in their car. Some soil-related diseases include wound infections, gastroenteritis, and specific respiratory syndromes, according to Dennis J. Baumgardner, MD on Medscape.com. Many of these health related symptoms are acquired simply by ingesting dust, or dirt, containing the bacteria. When dirt settles in a vehicle, the likelihood of someone ingesting some harmful bacteria increases significantly. Also, dirt inside the vehicle can affect the way that a driver feels in the long run. CarCar.com mentions that when the inside of a car is clean the driver and passengers feel better about themselves and the time they spend in the vehicle. Taking the extra step to get a vehicle detailed could be the thing that changes a bad mood into a great one. Don’t let dirt impact the mood or the health of a car’s passengers. Let the trained technicians at Mr. Clean Car Wash remove the dirt from the inside and the outside with a full service Signature Shine. Right now customers can get $5 off any single detail service as well.